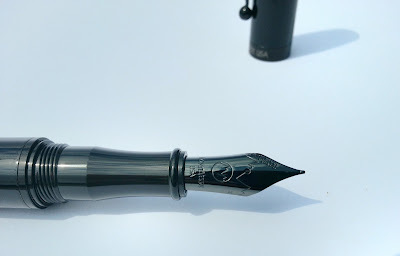 I've been covering a lot of fountain pens lately, and to be honest, there isn't a single one of those that I don't like! But this Monteverde Incinvia beats them all, on style that is! It might not beat the Lamy Persona if it comes to smooth writing, but of course the Persona is a totally different ballgame, costing 200+ Euros more than this one! From a design perspective, I think this is the most beautiful pen I own! It looks incredibly slick, with it's all black design. 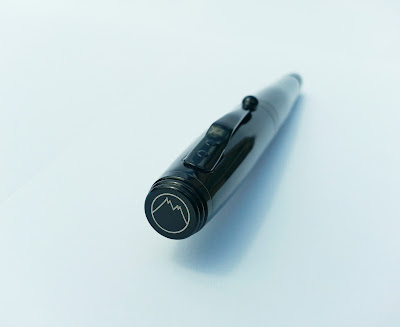 Even the nib is black, I don't know how they did that, but it certainly looks great! The logo on top of the cap, and the brand and model name on the bottom of the cap are the only details on the pen that aren't black. Instead they are 'printed' in a grey-ish colour, which contrasts nicely with the all-black pen! The stepdown from the barrel to the grip section might turn some people off. But it seems worse than it actually is, I don't find it annoying at all, but that might just depend on how I hold it. For it's size (13.5 centimetres/ almost 5.5 Inches, which isn't THAT small either, actually! ), it's a pretty heavy pen, so I generally use it without posting the cap, which would only add some more weight. It writes pretty good though. 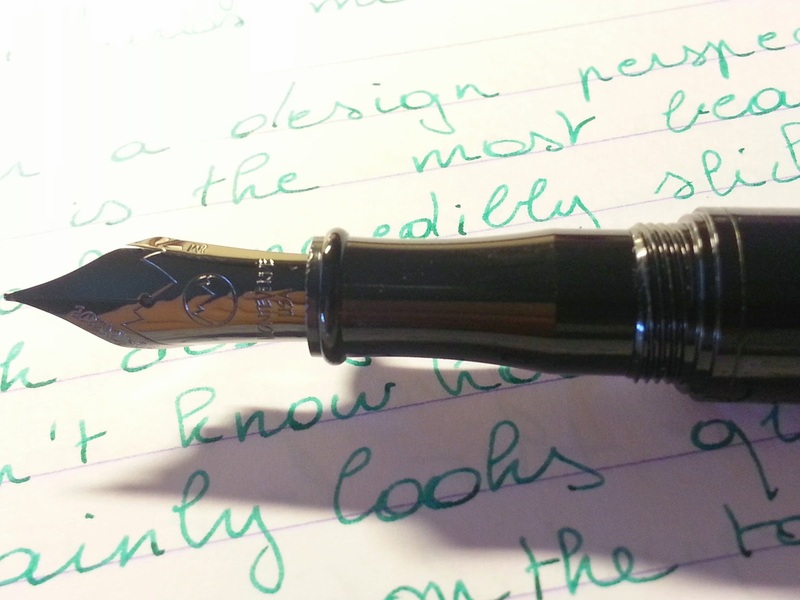 It's smooth, it doesn't skip at all, even though it writes a little dryer than most of my other fountain pens! 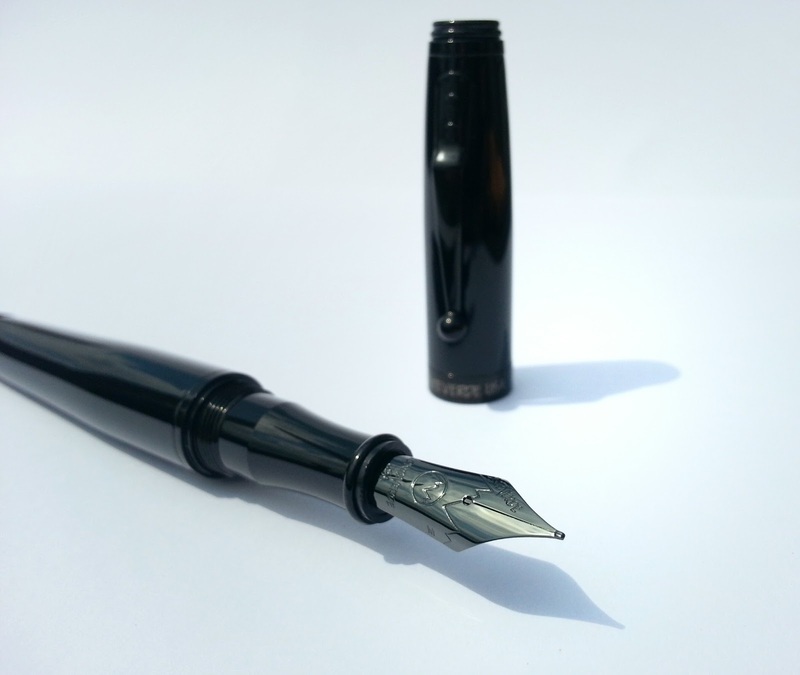 The nib gives some feedback, which I prefer over pens that glide on the paper, because those tend to make it harder for me to control my writing. Whereas with this pen I can write pretty neat! Together with the Visconti Van Gogh, Lamy Persona, Faber-Castell Emotionn, Kaweco ACsport and the Lamy accent fountain pen (I didn't review that last one yet!) It is part of my Top six!? (I couldn't make a Top five, I just love them all!) 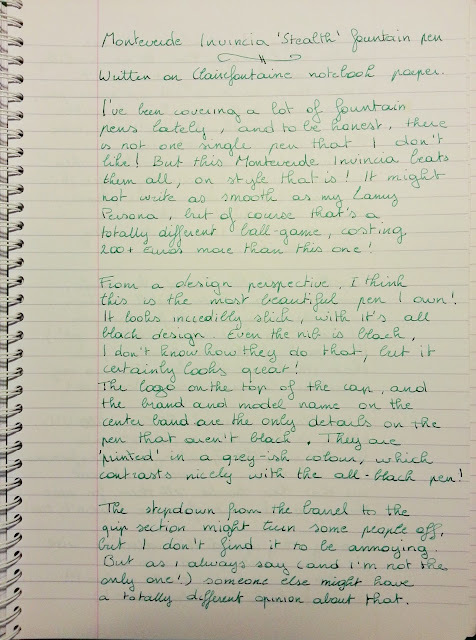 of best fountain pens that I currently own! Congratulations Monteverde! 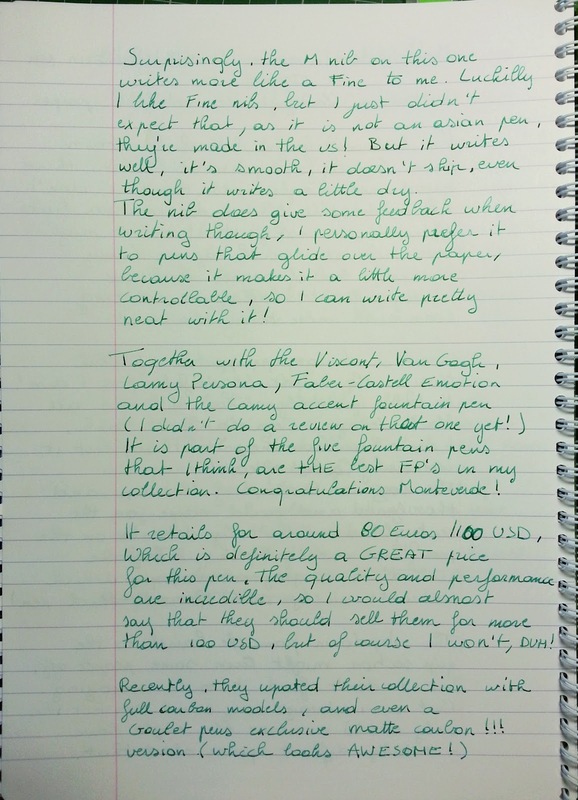 It retails for around 80 Euros/ 100 USDollars, which is definitely not a cheap pen! But I find it a GREAT price for the quality and performance you get for that money! I would almost say that they should be more expensive, but I obviously won't, Duh! Thanks! I practiced ;-) It would look stupid to have a pen collection without being able to write properly!